The winter fur from the tail of the Siberian male Kolinsky makes the best soft-haired brushes because of its unique properties. It's extremely soft and supple, yet strong and elastic. 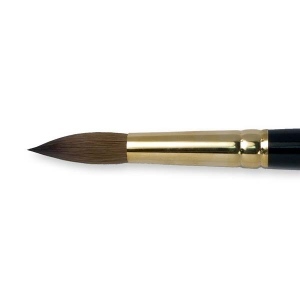 Crafted to take advantage of these special qualities, Kolibri Kolinsky brushes are made with longer tapered Kolinsky hair, hand-cupped by our expert brush maker to produce a precise point. 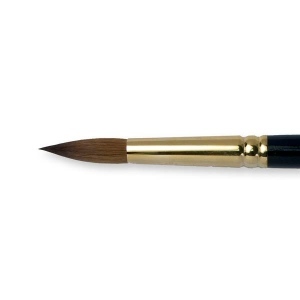 A dense hair count and full, tapered belly maximizes the brushes' holding power. 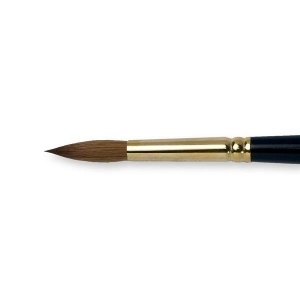 The hairs are deeply set into the seamless gold-plated ferrules, producing excellent spring and control, and return to a point immediately when raised from the painting surface. 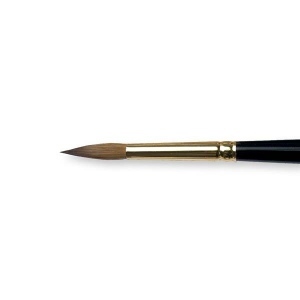 The short black polished handles are made of hardwood and are lacquer finished for long life. Only the best brush handles are dipped. They are made by lowering the handles first in primer, then twice in colored lacquer and finally in varnish -- a total of four coats -- for a lustrous durable finish.